When it comes to food, why settle for anything less than the best? If you think regular pizzas are heavenly, wait until you try a slice of the best wood-fired pizza. Fond du Lac pizza enthusiasts and foodies from all over the globe seem to love the taste of pizza that has been cooked in a traditional oven. With its delicious, savory taste and one-of-a-kind texture, wood-fired pizza in Fond du Lac is a food lover’s dream come true. If you want to try this classic Italian favorite, visit Benvenuto’s Italian Grill. Our restaurant is home to the finest wood-fired pizza in Fond du Lac. At Benvenuto’s Italian Grill, we are dedicated to providing a diverse selection of traditional Italian cuisine. From pasta to wood-fired pizza, Fond du Lac families are sure to find something to love at our restaurant. One of our house specialties is our hand-stretched, wood-fired pizza. Fond du Lac foodies and pizza lovers from all across Wisconsin travel to our restaurant to get a bite of our culinary masterpiece. People who have never tried wood-fired pizza in Fond du Lac may think that it tastes the same as any pizza cooked using other methods. However, this simply isn’t true. Wood-fired pizza in Fond du Lac is known for being distinctively flavorful. Although yummy pizzas can be cooked using gas or electric ovens, nothing beats the taste of pizza that has been cooked in a wood-fired oven. Thanks to even heat distribution from the oven, wood-fired pizza in Fond du Lac has a unique, smoky flavor that’s impossible to replicate when using other oven types. Do you prefer pizza crusts that are crispy or chewy? 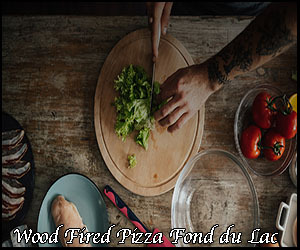 With wood-fired pizza, Fond du Lac food lovers can have the best of both worlds. Pizzas that are cooked through a wood-fired oven have a one-of-a-kind texture. The crust of a wood-fired pizza in Fond du Lac is crispy at the bottom and chewy on top. Nothing is worse than waiting for your meal to cook while you’re starving. Thankfully, when you order wood-fired pizza in Fond du Lac, you won’t have to wait too long for your first bite. Since the oven used to make wood-fired pizza in Fond du Lac can be heated to high temperatures, you can expect the cooking time to be short. We’ll have your wood-fired pizza in Fond du Lac served to you fresh from the oven, and you can start digging in as soon as possible! For health-conscious food lovers, eating wood-fired pizza in Fond du Lac can be a great option. Cooking pizza over an open flame in a wood-fired oven allows the vegetables to retain specific nutrients and antioxidants. So, if you want a delicious yet more nutritious meal, wood-fired pizza in Fond du Lac could be perfect for you! Enjoy Eating Wood-Fired Pizza in Fond du Lac! At our restaurant, you can expect nothing less than the best food and service. If you’re interested in learning more about our delicious wood-fired pizza in Fond du Lac, feel free to contact us. We’ll be more than happy to answer any of your questions about our delightful Italian cuisine! What started out as a dinner-only, Italian dining experience quickly grew into the thriving business it is today. Our menu once included only a handful of pasta dishes and a few wood-fired pizzas. Now, we offer a vast selection of expanded entrée options, individual dishes, and even a few grilled items. We have also started serving lunch, and we have opened six different locations across Wisconsin. Click here to learn more about our history.